Alright so check it out. 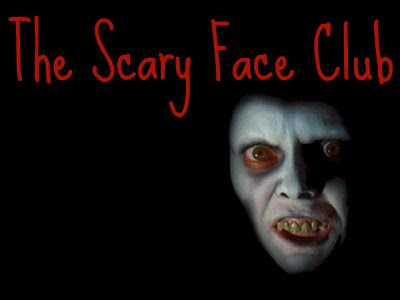 Anyone not familiar with what The Scary Face Club is click here. And please for the love of The Donald, do NOT tell me that I "missed" a scary face. This is not a list. This is a HUGE list that gets updated every month with 5 new faces. Jeesh. Now, Secretary Countess will update us about what happened last month. 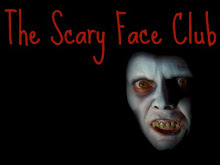 Last month we had a first for the Scary Face Club (Not that that's a big deal since we only just started 2 months ago). Two inductees were added to the club based on their actual physical appearance and not their makeup. To avoid the glare of human rights groups like, "ugly people against other people calling ugly people ugly" we've noted that these individuals are just really good at acting. Last meeting we inducted the following 5 scary faces into The Scary Face Club. Thank you Countess. And now onto this month's inductees! 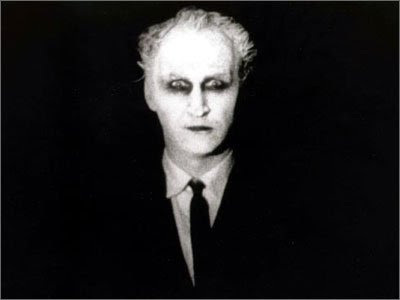 It's surprising that Herk Harvey who plays "The Man" in Carnival of Souls is uncredited. I say this because he has what is perhaps the most memorable role in the entire film. I used to have these nightmares when I was little, that I'd be driving with my parents, look out the back windshield and see a terrifying man floating up behind us. After I saw Carnival of Souls for the first time, I had an eerie feeling that I had somehow caught a glimpse of this movie on TV when I was younger. How else do you explain a nightmare so creepishly similar? The fact is--The Man is very scary. He pops up both expectedly and unexpectedly throughout and his appearance never gets any easier to handle. I hate how he's always just there. He ends up being sort of like The Countess in that respect in that I pray to god that when I enter a dark room and flip the lights on, he will not be there. He will though one of these days....I just know it! 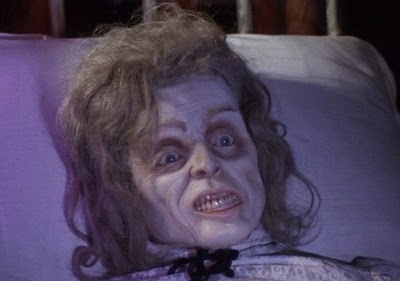 I know there's a lot of people out there who were traumatized by Karen Black's final smile in the last segment of Trilogy of Terror. Unfortunately I'm not one of them because I saw the film for the first time recently and not when I was a wee lass. Luckily, I am still fully aware what a terrifying face that is. It really seals the deal on what was largely a very hilarious little segment about an evil Zuni doll. 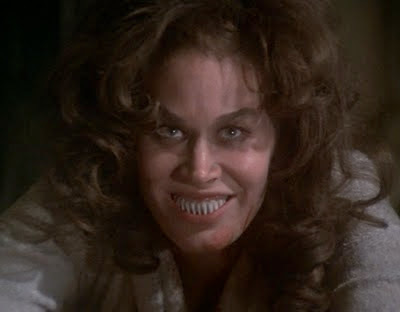 Try as I might, I can find very little to laugh about when faced with Karen Black and her pointy teethy grin. 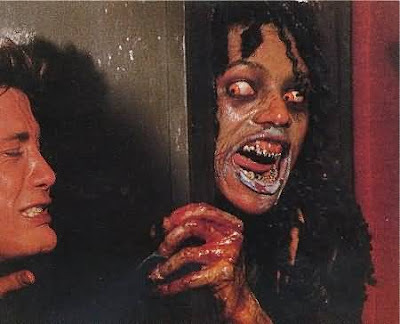 Although Angela's final look at the end of Sleepaway Camp is scary for a very different reason, one cannot avoid the fact that the way her head is cocked and the way that she's doing that horrid silent scream thing is terrifying. I am again thankful that I did not see this when growing up because I would have been completely terrified of not only young girls with long brown hair but also of penises. I had the pleasure of interviewing Geretta Geretta for a segment during Black History Month, and I was relieved to find that she was A. Not actually a demon in real life and B. not scary. This doesn't mean however that I don't still have nightmares of Rosemary's face peeking around the corners of movie theater walls. I think it's the long fingers and fingernails. Or is it the oozing pustules? 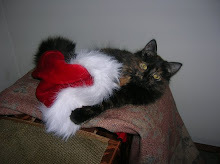 Or is it maybe her demon eyes? Whatever it is, it is scary. So welcome to the Scary Face Club Rosemary, but please....keep your distance and don't drip your pus on me! Two Angelas in one post?! AND two movies about demons?! I'll have you know that the box cover of Night of the Demons still remains firmly ingrained in my mind as the scariest thing to ever be put on a VHS box cover. My eyes used to be drawn to that horrible demon face, they were caught in a tractor-beam. I was entranced and attracted to it without wanting to be. When I finally saw the movie for the first time and realized that our lead woman Angela was going to turn into that THING, I had a mini-break down and dreaded the moment of her transformation. This is still a very upsetting face for me and I hope I'm not alone when I say that it makes me pee my pants just a little bit. Good call on Herk Harvey as THE MAN. 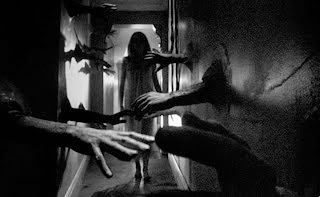 Carnival of Souls gets a bad rap in some quarters b/c its plot has been ripped off so much even the original seems like a cliche now, but I think it's just a beautiful, layered movie over and above the oft-imitated "twist." The dance at the abandoned amusement park is gorgeously creepy, and you're right, The Man's look never gets any easier to take, even when you know he's coming. 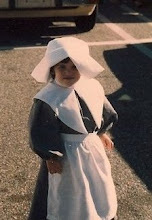 I've always planned to try a Man costume for Halloween...maybe this year is the year! Hey, you missed one. Kidding, kidding! :-P Sorry, I had to. Great additions. The pointy toothed smile sure is creepy. Great choices! I'm always terrified by The Man, and Karen Black - in all her roles, actually. And I'm all about free food, so count me as excited! I agree with you totally about the cover of Night of the Demons. I remember as a teenager in the 1980's being scared shitless by it!! It has definitely ingrained itself in my mind even though I think the movie itself is dated and bordering on garbage! !